Screenshot of video of the encounter between a Covington Catholic student and a Native American man beating a drum. 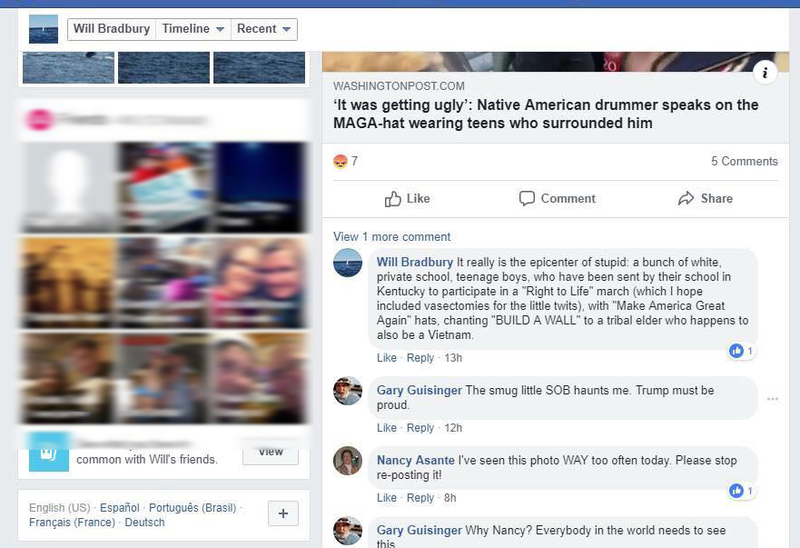 EASTPORT, MAINE – As the Covington Catholic controversy raged, Will Bradbury, the Chair of the Eastport School Committee, took to Facebook to share a Washington Post news article and attack the so-called MAGA kids who had been thrust into the center of a national controversy. The article Mr. Bradbury posted shared the perspective of Nathan Phillips, the man who was seen on video beating a drum while standing inches away from a young man in a “Make America Great Again” hat. It really is the epicenter of stupid: a bunch of white, private school, teenage boys, who have been sent by their school in Kentucky to participate in a “Right to Life” march (which I hope included vasectomies for the little twits)…. Screenshot of Eastport School Committee Chair Will Bradbury’s comment about Covington Catholic students. Portion of image blurred to protect the privacy of Mr. Bradbury’s friends. According to the City of Eastport’s website, Will Bradbury’s term on the school committee is up in 2020. The website Public School Review reports that Eastport Public Schools serves approximately 200 students. The controversy originally exploded after a brief video clip of the encounter was posted online and quickly went viral amid claims the students were harassing and intimidating a Native American man beating a drum. Additional videos of the incident, however, appeared to disprove the original claims of intimidation and showed the student most prominently featured standing still, smiling and not reacting to the drum beating or taunts from other protesters shouting about issues of race. Ultimately, both the student and the man beating the drum say they were attempting to defuse the situation created by other protesters shouting obscenities. Since the incident became national news, Covington Catholic, the school the boys in the video attend, has had to cancel classes due to security reasons. The Catholic Diocese of Covington, Kentucky was reportedly evacuated after receiving a suspicious package on Wednesday evening. In 2016, Hillary Clinton edged out Donald Trump among Eastport voters by 99 votes, but Trump carried Maine’s Second Congressional District, where Eastport is located.